Standing rigging Norselay to 7.8mm fitted 1996. Test certificate available. Alan Buchanan is a well-respected post-war designer of seaworthy wooden boats. This example is notable for being lovingly maintained by her liveaboard shipwright owner for 30 years. This included a refit completed in 2016. He had to return to the UK from the Caribbean but has left the boat in careful capable hands. She is clinker-built mahogany, epoxy sheathed by her owner 10 years ago. Suitable for liveaboard use or weekend cruising, systems are simple so have low maintenance demands and enable self-sufficiency. 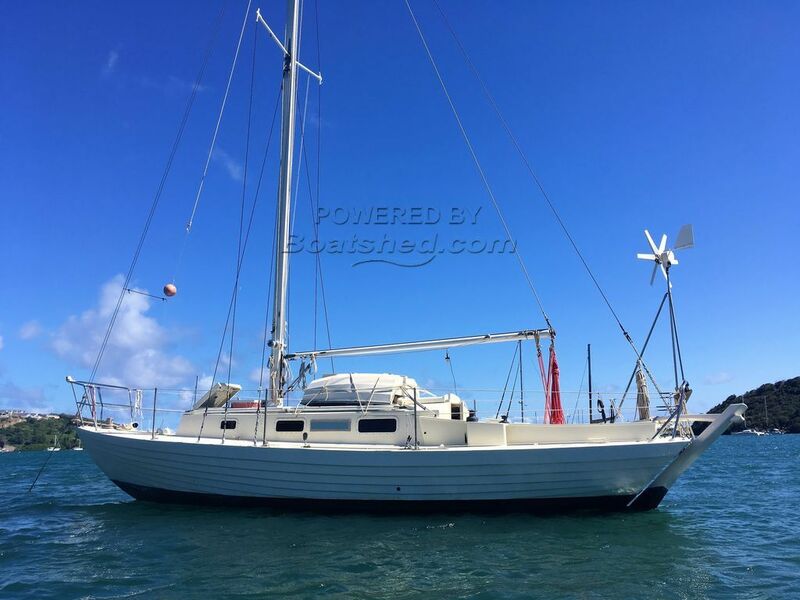 She comes complete with sails, tools and nesting sailing dinghy. I went on board after a few weeks of heavy rain and saw no sign of water or damp, either in the bilge or through hatches/ports. This Alan Buchanan 32 East Coast One Design has been personally photographed and viewed by Anita Sutton of Boatshed Grenada. Click here for contact details.